A cheesesteak from John’s is nothing to sniff at, but the titular offering from this storied sandwich shop sets it apart as one of Philly’s best places for a sandwich. 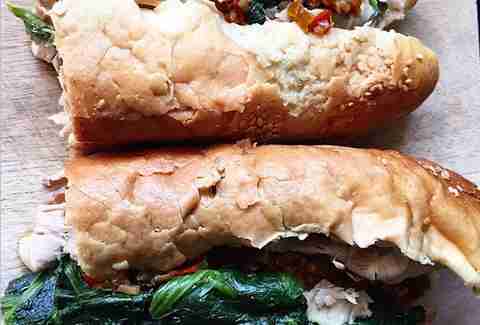 Authentic ingredients and juicy roast pork, complete with perfectly toasted bread and spinach seasoning, make this sandwich a must-have. 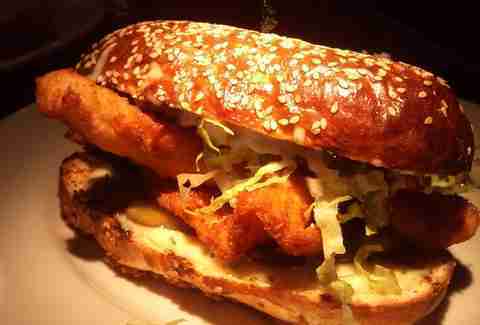 Once you’ve worked up an appetite sampling a revolving door of local beer at JB’s, soak up the goodness with the perfectly fried and subtly spicy crispy catfish sandwich. Romaine, horseradish pickles, and tartar sauce top it off, which by the way, is also what you should do with your beer right about now. You will either love or hate yourself after eating the Doh! Nut, but you’ll definitely love IT. 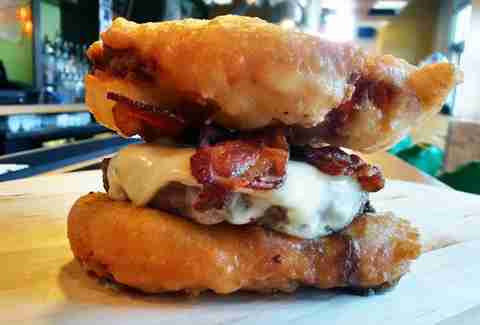 All the fixings of a regular burger, but instead of bread, it’s sandwiched between two sweet slices of fried donut, making this sweet-and-savory combination a must-have for... well, anybody. 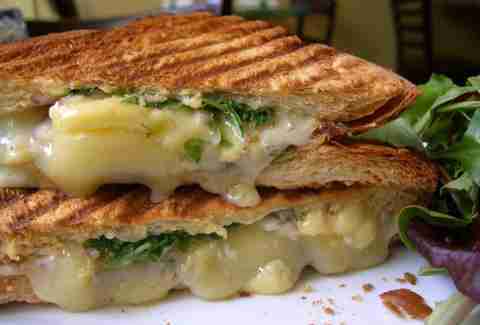 Every Wednesday at Wedge + Fig it’s time for the panini of the day (PoD). 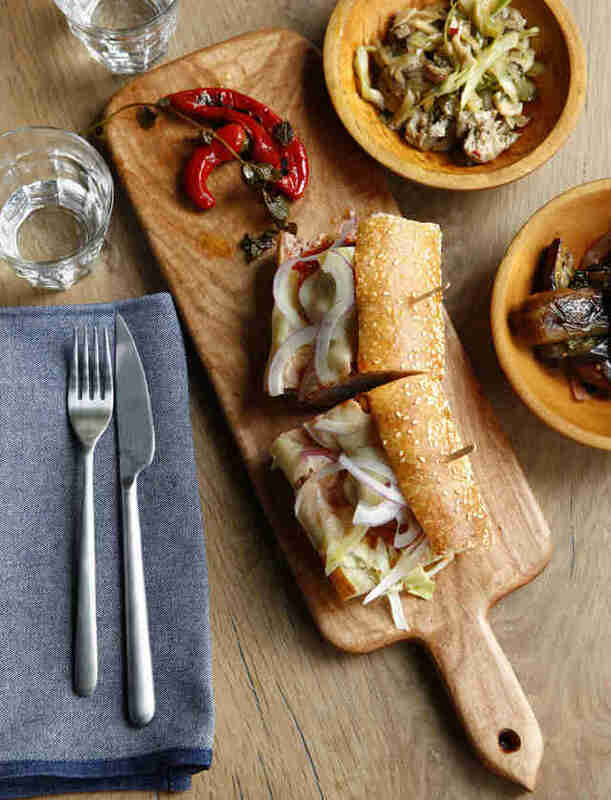 Specialities include variations on the classic grilled cheese made with unusual ingredient combos, and fresh takes on some classics, such as the Machu Picchu (a blend of fancy cheeses and an apple-fig chutney on onion pocket bread) or the May Day (roasted pork belly with bacon-mustard collard slaw on rye). If you want to win at ordering lunch against whatever poor soul is eating with you, the duck meatball sandwich is your ticket to victory. The Italian standby is doused in tomato sauce and reinvented with liver mousse and Swiss cheese on a semolina hoagie roll. A BLT is anything but simple when fried calamari and aioli sauce is thrown into the otherwise classic mix: The Industry's signature sandwich includes, of course, crispy bacon, lettuce, and tomato, but is taken up a notch with an ever-changing selection of the day’s fresh catch. 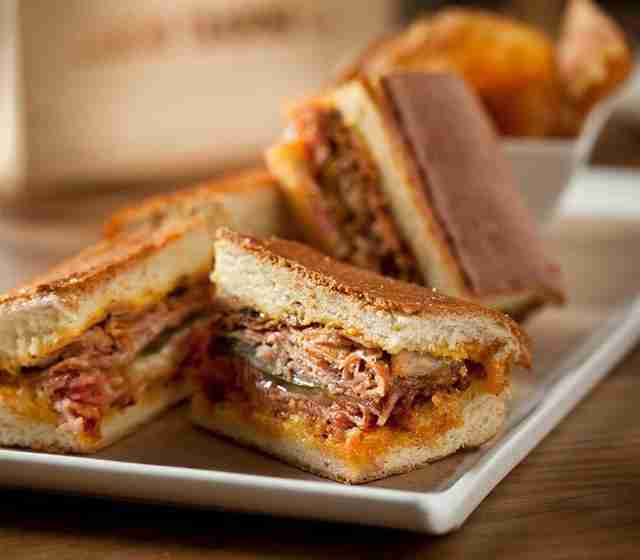 Ham and roast pork, along with melty Gruyere and lightly toasted bread, with a side of crisp, thinly sliced pickles make Garces the go-to spot for a lunchtime Cubano. If you can’t trust Garces to do it right, who can you trust? 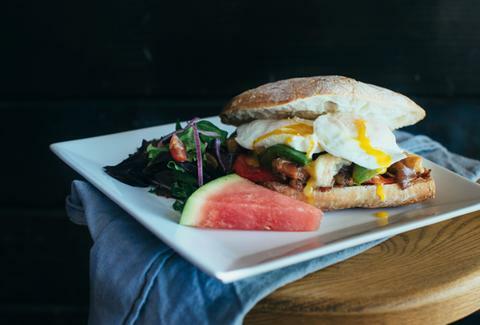 The breakfast-y sandwich includes two over-easy eggs, juicy Italian bacon, potatoes, onions, peppers, and fontina on ciabatta bread, and is so good you should probably also order it for not-breakfast. 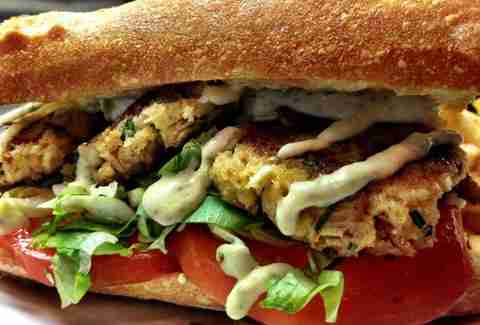 For one of the best po-boys in Philly, head to Reading Terminal and spend about an hour trying to decide which one you want from Beck’s. 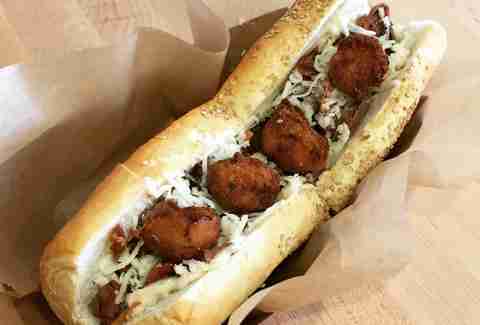 The Cajun and Creole eatery offers breakfast options on French bread or lunch options where you can pick from fried oyster, alligator sausage, fried shrimp, and others. 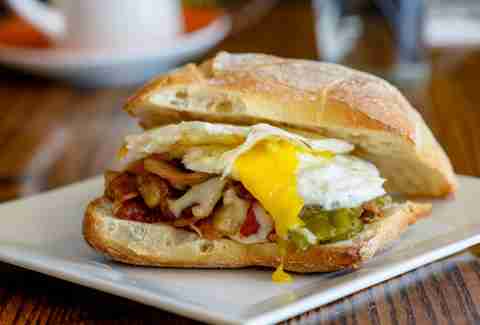 Push all those cheesesteaks aside and this may well be Philly’s most famous sandwich. 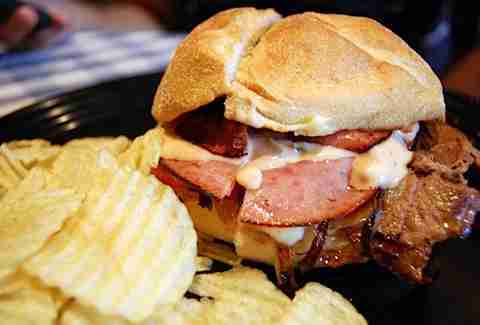 Repped everywhere from our stadiums to this long-standing restaurant and bar, the steak & grilled salami sandwich has topped many a national list and has enough flavorful layers of meat and gooey melty cheese to put any old hoagie to shame. The Garlic Bomb from Jake’s is true to its name. 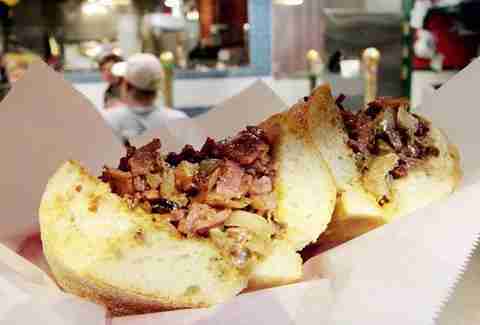 Explosions of garlic unfold side by side with finely cut brisket. You may have to order off the menu for this one, so when you do, be sure to get some barbecue sauce into the mix to add an extra pow to all the garlic.